If you're looking for the mid-grade, non-HEMI V-8 offered just last year--don't. The 4.7-liter V-8's been retired, leaving the Ram 1500 with only excellent drivetrain choices. The 2014 Ram 1500 brings a new turbodiesel to its class-best fuel economy ratings; it's also tops in cabin finish and infotainment, but lags in towing. The rivalry between full-size trucks has risen to new heights; yet the 2014 Ram 1500 remains one of our favorite full-size pickup trucks. The light-duty Ram pickup already sported the best EPA gas-mileage ratings in the segment for its base V-6/eight-speed drivetrain combination, and now it's doubling down with a turbodiesel option. Over the years, that scaled-down big-rig look has made it easy to spot the Ram 1500 from a distance. The changes wrought in 2013 are carried over to 2014: the grille is slightly taller than before 2013, and the Ram crosshair grille is now flush. The foglamps are new, and so are the headlamps--a twin-beam projector design with LED running lamps, turn signals, side-marker lamps, and tail lamps. Inside, the Ram 1500's cabin still looks fantastic: the reworked center stack and climate-control, multimedia and infotainment interfaces are the best of all trucks. We're still at odds sometimes with the eight-speed automatic's rotary shift knob. It's supposed to be easy to use with work gloves, and easier to fit in across a wide range of seating options and layouts, but we still find ourselves reaching for a ghost shift lever. Of all the cabins, the Laramie Longhorn is our favorite, with its genuine burl walnut and plush leather. Chrysler's Pentastar 3.6-liter V-6 is the base engine in the Ram 1500, and it's tuned for 305 horsepower and 269 pound-feet of torque in the full-size truck. It's powerful enough for casual truck users, and is rated at 17/25 mpg--18 mpg city when stop/start technology is specified, making it the best full-size truck by a wide margin. Its eight-speed automatic doesn't feel at all busy, though the rotary-knob shifter takes a while to grow accustomed to. It's now a relevant piece of the Ram powertrain puzzle, even before you factor in the additional eco gold of a stronger but lighter-weight frame (more high-strength steel), aerodynamic shutters, low-rolling-resistance tires, and pulse-width modulation (which improves the efficiency of the alternator and accessories) and a new thermal management system. It's just not all that strong--towing is rated a few hundred pounds less than the V-6 F-150, GMC Sierra, or Chevy Silverado. 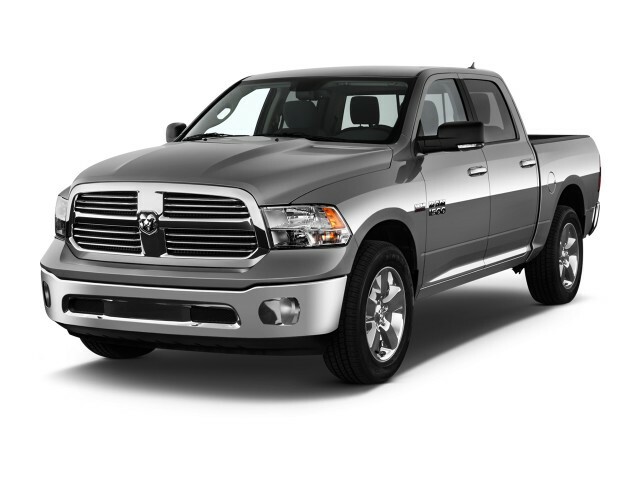 New for the 2014 model year is the excellent EcoDiesel, a 3.0-liter turbodiesel six that make the Ram 1500 the first full-size light-duty pickup to offer a diesel in America. It's rated at 240 hp and 420 lb-ft, same as it is when it's fitted in the Jeep Grand Cherokee, and it's coupled to the eight-speed automatic. Offered in a range of models, it's priced nearly $3,000 higher than a similarly equipped Ram with a HEMI V-8, but fuel economy of 20/28 mpg is much higher. HEMI models now make 395 horsepower and 407 pound-feet, and they incorporate both variable valve timing (VVT) and a cylinder shut-off system. A version of the new eight-speed automatic is paired with the HEMI, though a few of the lower-cost trims continue to carry over the six-speed automatic. The 4.7-liter V-8? It's finally gone. If cost is no object, the HEMI's still the way to go, for its muscular power and 0-60 mph times of far less than 7 seconds. Four-wheel drive is available on every model, either in part-time or full-time flavor. Tow ratings are shy of the Ford and GM trucks: maximum capacity stands at 10,450 pounds, while Ford and GM trucks can hit 11,700 pounds. The big Ram's redesigned suspension loses no ground, and its ride quality still stands above all its competition for on-road smoothness. Electric power steering is new, and it's about what you'd expect in a work-duty application--though on-center feel is more than acceptable, there's almost zero feedback beyond a few degrees off center. The Ram's new air suspension option enticed us on the preview tease, but after driving it, we think there should be some more compliance dialed into one of its everyday driving modes: of the five that allow best-in-class ground clearance, step-in height, and departure/breakover angles, the "normal" mode is tuned to lower the truck at highway speeds for better gas mileage, and that tends to firm up the ride a bit too much. Standard safety features remain strong, with the usual airbags, stability control with a trailer-sway system, and hill-start assist. A rearview camera is available on all versions; rear parking sensors can be ordered on all but the regular-cab trucks, and front parking sensors are new for 2014. The Ram 1500 has gotten better at crash tests over time; it's four stars overall by the NHTSA test, but the IIHS still calls its roof strength marginal. Chrysler's big 8.4-inch Uconnect Touch screen-based system is available in the Ram, and it can incorporate Uconnect Access, which tethers the truck to Sprint data services, adding on a host of features including voice recognition, apps, and WiFi hotspot capability. The available navigation system offers voice-activated features, new 3D terrain imagery, and lane guidance, as well as fuel-price, weather, sports, and movie info through Sirius Travel Link. There's also a new seven-inch reconfigurable gauge cluster (in Sport, Laramie, and Laramie Longhorn models) that effectively replaces a conventional gauge cluster and can quickly communicate information depending on how it's customized, with up to three 'analog' gauges at a time (when towing, an owner would configure the trans temp gauge to be in the foreground, for instance). The Ram comes with new powered USB, SD card, and aux-in ports, as well as full iPod control via USB, as well as expanded steering-wheel controls. Other features offered in the Ram lineup are rain-sensing wipers, power-folding side mirrors, and a power-sliding rear window with defrost. Don't miss the innovative RamBox cargo management system either; it's now locked and unlocked with the vehicle's central locking system. The Ram 1500 strikes a tough pose, but it's a big, cultured softy inside. It's less distinctive, maybe, than it was when it first crashed the truck party back in 1994--but the Ram 1500's mas-macho grille and eighteen-wheeler aesthetics still have best-looking and gutsiest take of all the big trucks. 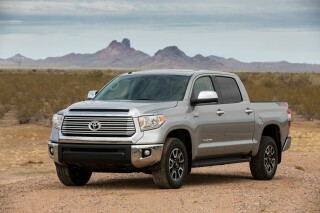 It's more of a visual callback to big rigs than the straight-edged Ford, GMC, and Chevy trucks, and doesn't have the cartoonish quality that keeps the Tundra at a disadvantage. Like any of the big trucks, the Ram's looks shift subtly as it moves between trim levels. There are five different grilles in all, each with its own texture and finish, even its own name. The rear taillamps are LED-lit, and so are the side-marker lights, but those are the minor updates applied to the business end of the truck since it was still a Dodge Ram, back in 1999. Last year, the Ram 1500's cabin was reworked even though it really didn't need to be. Its overall sense of high quality and upscale flavor were upgraded to an even higher level, making it even more attractive and desirable. New rotary controls for infotainment and climate systems clean up the center stack and free up more space, and a digital cluster replaces some instruments on some models--and even gets softly rendered numerals, so attentive are the details. Those with simpler tastes have plenty of options in the Ram 1500 range, from the simple Tradesman to the extreme luxury of the Laramie Longhorn, which has some of the finest wood grain and contrast stitching available in a vehicle of its kind. Each of the Ram's engines earns its truck keep; steering and ride are as good as it gets in big trucks. We've already known the Ram 1500 as one of the strongest performers in big trucks; last year's V-6 gave it a frugal edge as well. This year, the powertrains change again, with an old V-8 giving way, making room for a new turbodiesel--the first in a light-duty truck in modern times. The Ram's base V-6 is still the best choice for any truck user that needs an open bed more than they need a towing appliance. The 3.6-liter V-6 builds up 305 horsepower and 269 pound-feet of torque, and comes linked with an eight-speed automatic transmission. With towing of 6,500 pounds at most, the six-cylinder Ram's one of the lightest-duty propositions in full-size trucks--but how much does a good set of tools weigh? It'll haul home bales of pine straw without much effort, though it does move from a V-8-like exhaust note just off idle to a more strained sound once it climbs to about 80 mph. And though it takes a few tries to reach for a rotary shift knob and not a shift lever, the eight-speed automatic really makes the V-6 a relevant choice; it doesn't hunt endlessly or needlessly for the right gear. In the middle of the lineup, the Ram's old 4.7-liter V-8 has finally taken a dirt nap. Taking its place is a much stronger alternative to the base six, and one that could deliver much better fuel economy, too. It's a 3.0-liter turbodiesel V-6 with only 240 horsepower (typical for diesels) but 420 pound-feet of torque, and it's hooked up with that excellent eight-speed automatic for torquey performance and a little of the characteristic diesel clatter to go with it. Those extra gears slice and dice its narrow powerband into thousand-rpm increments for excellent around-town flexibility that gets strained, just like the gas engine, once you're passing any legal highway speed. Rated at 9,200 pounds towing max, the turbodiesel delivers unladen 0-60 mph times in the 8.0-second range, and with it comes Chrysler's promise of highway fuel economy better than the gas six's 25 mpg. Stronger performance and better economy will cost from $3,000 to $4,000 more than other comparably equipped Rams. If gas prices and sticker prices were no object, the HEMI-powered Ram 1500 would be the easiest choice. The sounds that pipe into the cabin from the big 5.7-liter V-8 are enough to open new hair follicles. The barrel-chested eight makes 395 horsepower and 407 pound-feet, thanks both to variable valve timing (VVT) and a cylinder shut-off system, and connects to either a six-speed automatic or the new eight-speed gearbox. Brawny power enables 0-60 mph acceleration as quick as 6.7 seconds as well as the highest towing rating of the lineup--10,450 pounds in long-bed, rear-drive form. Four-wheel drive is available across the Ram 1500 lineup. On any model, a part-time system is the basic setup, but Ram's on-demand system takes care of the traction all the time, though it's only offered on the 5.7-liter HEMI-equipped versions. It's not just HEMI grunt that makes the Ram a joy to drive. Hauling and towing are other strong suits of the Ram, but in the past few years, ride and handling--the truck variety--have won us over, too. The Ram's steering is now electric, and it's quicker than before, with decent on-center feel. 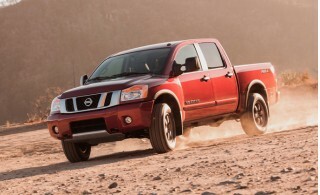 It's not fair to expect much feedback from a huge-wheelbase, four-wheel-drive truck, so don't. It's still about the best you'll find in a full-size truck. The ride quality's now even more dependent on how you outfit your truck. The chassis and suspension have been reworked, with a retuned suspension (control-arm, independent in front) giving the Ram its usual more relaxed attitude, even in unladen 4x4 models. The new setup's also been designed with an optional air suspension in mind. The air suspension seems to be adapted from the one found in the Jeep Grand Cherokee, and if you trace that vehicle's lineage, you might suspect it's also related to the one in the new Mercedes GL Class. No matter the origin, it's a setup that could use a little more softness in its most dynamic setup. The setup offers five ride heights (normal, aero, off-road 1, off-road 2, and park mode), and enables best-in-class ground clearance, step-in height, and departure/breakover angles. It can be changed by the driver via the keyfob, to lower the height for step-in or loading--but with more attention paid compressing the suspension at speed for better aerodynamics and hence better fuel economy, there's less compliance left for bumpy surfaces and uneven textures. As a result, the ride quality's a little more firm and tense than before. Combine the air suspension's versatility in its other modes with the basic setup's smoother everyday ride, and we'd be convinced to ante up for its $1,500 price premium. The Ram's flexibility is second to none in trucks, and interior quality has never been finer. The Ram 1500 already had one of the best interiors in the full-size pickup class--and among all Chrysler vehicles--but last year, it merited a complete interior reskin that's left it pretty dashing, especially on truck terms. It's not much larger or more comfortable than the GMC, Chevy, and Ford trucks in critical dimensions, but it's fitted in some cases with more clever storage solutions that just aren't offered by the other Big Three and Japanese-brand pickups. The Ram 1500 comes in three body styles, the most basic being the two-door Regular Cab, which has a sliver of cargo space behind its bench seats. It's the one seen most often in fleets. Next up is the Quad Cab, which has two front-hinged, full-size doors and two front-hinged access doors that expose its slightly larger stow area behind the seats. For most buyers driving, not operating, a Ram 1500, the four-door Crew Cab makes the most sense. It has four real doors, real leg and head room for rear-seat passengers, and those thoughtful storage touches. Every Ram has a wide stance, which can make its base bench seat stretch on for a day, visually. Three adults will fit easily across, with a decent amount of leg support. The seats themselves: they're wide and flat, doing an honest imitation of their Midwestern roots, for better or worse. When the bucket seat option's picked, the Ram gets a center console between those seats; it doesn't just separate front passengers, it puts a nightstand-sized berm between them. There's a nicely padded section on the driver's door that's perfect as elbow-resting space, something some $75,000 luxury sedans don't get right. On those bucket seats with power adjustment, the range of adjustment is very good, typically allowing tall drivers to move the seat lower than in other vehicles--just as important as tilt steering in setting up a good driving position. Adjustable pedals are offered on expensive models, if the driver's short of leg. In the rear seat on Crew Cab Rams, there's little of the bolt-upright seating position that still afflicts the GM trucks, even after a redesign. The Ram offers up abundant leg and head room. In general, there's plenty of storage space inside the Ram 1500. If you can't find a place to store something inside the Ram, you're not looking. There's a storage bin on top of the center stack, one ahead of the center console, huge cupholders, deep door pockets, and trays for change and pens and anything you'll need to use safely on the road. There's even a stow area under the middle front bench seat on some versions, big enough to hold a pie. Under-floor storage bins supplement the optional, lockable Ram Box that can be integrated into the fenders, and locked by remote from the key fob. The variety of truck beds available is as important to commercial buyers as to individuals. Regular-cab Rams can be had with 6.4-foot and 8-foot beds, while the Crew Cab models come with a 5.7-foot or a 6.4-foot bed--the latter, the only bed on the Quad Cab this year. A new 6'-4" bed option is now available on Crew Cab models giving customers the ability to combine Ram 1500’s largest available cab with the largest four-door/bed combination. A spray-in bedliner is standard at the top and the bottom of the lineup; all other versions have an option for a molded, drop-in bedliner. Noise suppression is admirable inside the Ram, with both road and wind noise held to very low levels for the full-size pickup class, and just the right amount of diesel clatter in the newest addition. Interior quality and feel are as good as or better than any other truck on the market, with the redesigned dash a standout in the class, even before the Longhorn's distinctive walnut trim is applied. There's just more attention to detail and trim quality in the Ram than in almost every other full-size truck, though Ford's F-150 is certainly in the same league, especially with its King Ranch and Harley editions, as are the latest GMC Sierra Denali and Chevy Silverado High Country full-sizers and Toyota's Tundra 1794 edition. Crash-test ratings have improved over time, but they still lag some of the best full-size pickups. Crash tests haven't been entirely reassuring with the Ram 1500, though new safety technology keeps cropping up on its order sheet. Prior Ram trucks had difficulty with the federal and insurance-industry crash tests, too. So it's a relative improvement that the most recent Ram 1500 (scores from 2013 haven't been officially carried over to 2014 yet) earns some "good" ratings from the Insurance Institute for Highway Safety (IIHS). The IIHS has yet to put the Ram through its side-impact tests, though, and when it comes to roof-crush strength, the Ram is rated as "marginal," with final numbers coming in below some passenger cars. The National Highway Traffic Safety Administration (NHTSA) has in the past given the Ram 1500 some low, three-star scores for side-impact protection, but the current version gets four stars overall, including a five-star rating for side-impact protection. The usual airbags, anti-lock brakes, traction and stability control are standard on all Ram 1500 pickups. Every trim line also gets standard hill-start assist, which maintains braking until the gas is engaged on an uphill ascent, and trailer-sway control, which uses anti-lock braking to mitigate the wagging effect induced when towing. On the features list, all models offer a rearview camera either as an option or as standard equipment; rear parking sensors are available or standard on all body styles except the regular-cab versions, and for 2014 front parking sensors also are available. The more expensive Laramie and Longhorn editions also offer adjustable pedals, a boon to shorter drivers in particular. Blind-spot detectors aren't offered, but large, folding trailer side mirrors enhance visibility, which is mostly excellent--though we still recommend the rearview camera due to the Ram's high tailgate. The Ram 1500 has supple Longhorn leather interiors, in-car Sprint data connectivity, and reconfigurable gauges; it's more sedan-like than some Chrysler sedans. Like most other full-size pickup trucks, the Ram 1500 has a multitude of personalities, ranging from the basic $25,000 Tradesman rear-drive, regular-cab work truck, to the $50,000 Laramie Longhorn 4x4. On top of that, the new Ram 1500 EcoDiesel powertrain commands its own $2,850 premium--on top of prices for the HEMI with the eight-speed automatic. Ram buyers can choose from between ten different trim levels. They include the Tradesman, Express, HFE, SLT, Bighorn/Lone Star (regional packages), Outdoorsman, Sport, Laramie, Laramie Longhorn, and Limited. Most can be configured with a variety of cab styles and bed lengths, but the HFE--the high fuel-economy model--comes only in the regular-cab, short-bed configuration, while Laramie Longhorns can be ordered only with four full doors. Trucks can be pretty lightly equipped, since some fleets just don't need nice things like CD players and power windows. The base Ram 1500 only comes with wind-up windows, manual door locks, a vinyl bench seat, a spray-in bedliner, and an AM/FM radio with a USB port. From that baseline, the Ram groups features by model line, with more rugged versions offering the most towing capacity (more than 10,000 pounds) and with luxury lines piling on features like remote start, heated leather seats, a rearview camera, and Chrysler's UConnect systems of infotainment, Bluetooth connectivity, and navigation. Some of the Ram's nicest touches are small ones, like its steering-wheel audio controls. Chrysler's long fitted convenient radio controls to the backside of its steering wheels, where they make sense--but we wish they'd enable a back-and-forth seek function via their rocker switches. Some Ram 1500 pickups also will get a new 7-inch reconfigurable LCD screen nestled in the gauge cluster, flanked by traditional dials. It can be customized with a range of information, from radio-station display, to trailer-towing status, to navigation direction. Trip-computer info is shown at the corners. The reconfigurable gauge cluster has useful fingertip controls, and the transmission now uses a rotary knob to switch gears, freeing up space on the console (some V-8s will still use a console or column shifter). Steering-wheel buttons take the place of paddle controls. For the 2013 model year, the Ram 1500 acquired Chrysler's well-thought-out Uconnect package of multimedia and connectivity features. It's the most user-friendly setup in any pickup truck, combining an 8.4-inch touchscreen with that separate display, tucked in between the gauges. Via voice commands or steering-wheel controls or UConnect's touchscreen, the Ram opens up clear channels of on-the-go communication, with quick responses to taps on its screen and easily comprehended functions. It also has some of the cleanest displays. The available navigation system, for example, has pretty 3D displays, overhead displays of lane guidance, and connects with Sirius TravelLink for gas prices, weather information, sports scores, and movie times. The system also offers text-to-voice translation with a fixed set of responses available at fingertip or voice control. The Ram's Uconnect Access setup takes connectivity to a semi-logical conclusion, by bundling Sprint data service with UConnect. Through the data connection, the Ram's universe grows to include voice recognition, mobile apps, and WiFi hotspot capability. It also enables some concierge-like services without the use of human operators. Mobile apps will enable owners to unlock and lock their Ram through the data connection; remote start works the same way, though obviously, a key will work more quickly when standing nearby. The apps and the functionality of UConnect itself will be updated via the Sprint link. Unfortunately, Sprint will be the only data provider, and your current data bucket can't be used, even if you're a Sprint customer. Other available options include a DVD player for both front and rear seat passengers; steering-wheel-mounted radio controls; Sirius Satellite Radio; and in Laramie versions, finely detailed interiors with a range of exterior color options, and on the Laramie Longhorn, real wood trim harvested from fallen fenceposts, burred by barbed wire. An available R/T package adds 22-inch wheels and tires and a restyled front air dam along with a 4.10 rear end and a limited-slip differential. Chrysler already leads the full-size fuel-economy race--even before the EcoDiesel's ratings are factored in. Chrysler's Ram 1500 pickups now offer some of the highest fuel-economy ratings in the full-size truck segment, with a new turbodiesel rated at 20/28 mpg, or 23 mpg combined. This year's base Ram 1500--the one with the Pentastar 3.6-liter V-6 and eight-speed automatic (and rear-wheel drive)--carries over its gas-mileage ratings of 17 miles per gallon city, 25 miles per gallon highway, and 20 mpg combined. 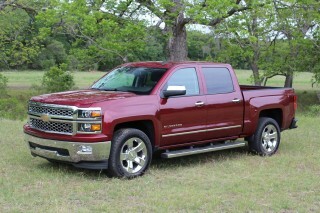 The GMC Sierra and Chevy Silverado V-6 are rated at 18/24 mpg, or 20 mpg combined; we'll call that a draw. 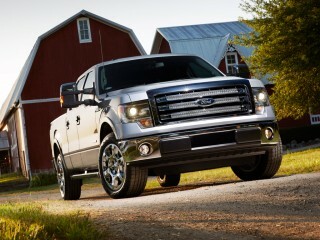 The Ford F-150 with the 3.5-liter V-6 and six-speed automatic checks in at 16/22 mpg or 18 mpg combined. Chalk up that as a win--for Ram. 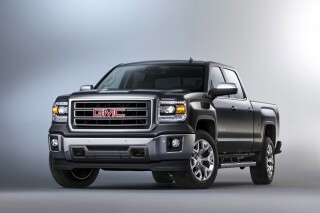 The gas-powered Ram can equal the GMC's city numbers, in HFE trim. That's where it adds active air shutters and stop/start, to boost city gas mileage to 18 mpg. However, once you option up to four-wheel drive, those numbers drop to 16/23 mpg. The Ram's mid-line 4.7-liter V-8 has been deleted for this model year, so the next step up the ladder is the HEMI V-8, now with either the eight-speed automatic or the older six-speed automatic, depending on the model. The 5.7-liter engine earned an EPA rating of 15/22 mpg or 17 mpg combined when outfitted with rear-wheel drive and the new gearbox; it's carryover 14/20/16 mpg numbers with the six-speed automatic. Four-wheel drive pulls the eight-speed model down to 15/21/17 mpg--not much worse than the V-6 F-150--and the six-speed, to 13/19/15 mpg. Great 1/2 ton EcoDiesel, to bad it had the Chinese sensors on the exhaust. the bad sensors , we are on the fourth set plus a whole new exhaust 12 months back, it rides better than most high end cars, average fuel economy =city 22.5+, highway 28.7+. when needed, it tows like a big... the bad sensors , we are on the fourth set plus a whole new exhaust 12 months back, it rides better than most high end cars, average fuel economy =city 22.5+, highway 28.7+. when needed, it tows like a big boy, or can plow thru the mud and deep snow with the best of them.it will cold start at -30F every time with out being plugged in. Interior layout is the best I have ever experienced and love the Uconnect system. 1. The exterior styling attracted me first, with the attractive front end leaning forward. The LED running lights front and rear are very attractive. 2. The interior sold me on this truck. So many storage... 1. The exterior styling attracted me first, with the attractive front end leaning forward. The LED running lights front and rear are very attractive. 2. The interior sold me on this truck. So many storage compartments and hidden bins, I never run out of places to store things. 3. The instrument panel and heating/control system is the best by far that I have ever experienced. The ease of use and funcionability is just amazing. The Uconnect system is the best system that I have ever experienced. By far better than the Ford Microsoft SYNC system I had in my Expedition, and much better than the outdated system I had in my Chevrolet Avalanche. 4. The 8 speed transmission has to be the best transmission I have ever had in a vehicle. It's always in the correct gear, very quick off the start because of the low first gear, and very respectable fuel economy for a Hemi because of the great overdrive gearing. Best truck I have ever owned. Looking for a different year of the Ram 1500?